please help save a noob!! i used ONLY FSB, Multiplier, voltage to adjust the speed. and i blew partition 5 times which led to 5 times of reinstalling..
any advices on reaching 1.9??? i dont know how to go from where without going unstable..
what do i touch? and set numbers to wat?! oh btw i just found out with everest that its tbred A sob sob..
No agp lock by the looks of it m8, try updating your bios? do i pump fsb with 11.5 multi after locking those? use a divider on the memory so that your memory doesnt run out of spec, could be listed as "asynchronous frequency". Have you found the pci/agp lock? so i ENABLE freqency thing rite? and no i havn't found the locking feature..
does that mean i have risk of blowing partition again for the 100th time? If you cant enable the pci/agp lock then you will keep nuking your hard drive's partitions/files/system files etc, it causes the ide controller to run out of spec causing file corruption and also overclocks the bus your graphics card is on. Try updating to the latest bios and if that doesn't give you the lock option in your bios then your overclocking is somewhat limited. i tried with the AF enabled.. at 150, 11.5 window wouldnt load..
btw about nuking the harddrive by blowing partition.. does it leave parminant damage? cuz i did that 6 times.. and it was brand new harddrive... if i screwed that, i am done for OC.. i have learned my lesson. btw thanks for helping me out.. u ahve been most helpful.. my attempt to run dod:S is futile with this old rig.. In theory it could lead to permanent damage, its best not to run the pci bus too far out of spec. Don't give up on overclocking, try a bios update and if that doesn't help then wait until you have a board with more overclocking options. i tried one mroe time . "using the divider on memory so it doesn't run out of spec"
wat is the limit spec of samsung ddr333 pc2700 512 ram? and if i am not running out of spec, is it okay to disable it and let it ride on high mhz? its okay as long as its not hitting the limit am i right? i would like to know the limit though if u could tell me. o and is it better to have high mhz on memorry (as long as its not running out spec).. 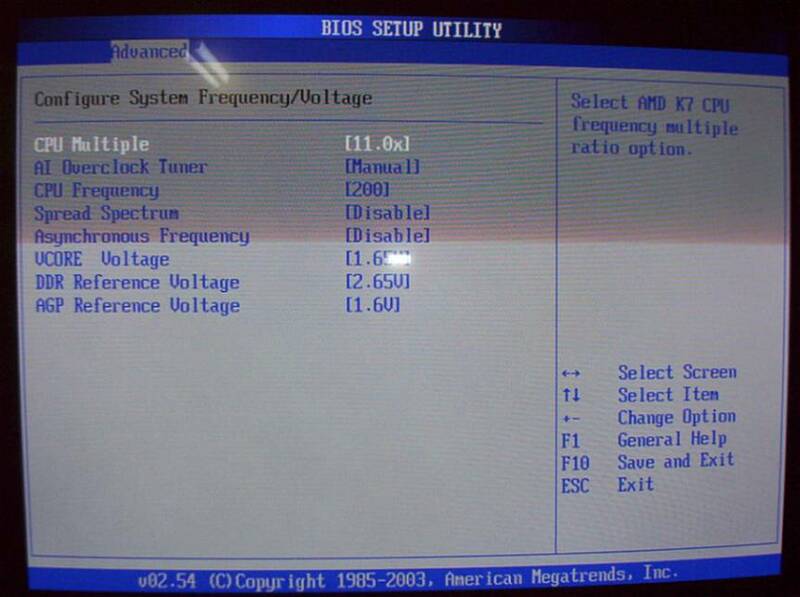 The AGP/PCI lock appears to be called "Asynchronous Frequency" in the BIOS. My understanding is that setting that to "Enable" will lock the AGP and PCI frequencies. I don't know the KT880 chipset, so I don't know if this will also lock the IDE interface, but I don't see why it shouldn't do so. DDR333 (or PC2700) is designed to run in spec with a maximum clock of 166MHz. How far over that you can go without hitting problems is down to the individual RAM chips. that lock the pci/agp bus at or near 33/66. fsb might be the way to go. so i guess that's pushing it..
no wonder fbs wont go past 148.
lets hope this sucker lasts another year.. this will help me stop spending any time gaming. great!! If errors are found, run chkdsk /f or some other file system repair utility to fix the file structure errors. does this mean i have a bad section and need to return it? cuz i ran it again after running chkdsk and it still says it founds error in file structure. Your HDD shouldn't be making loud clicking noises. If it is under warrantee, I would contact them. They may ask you to run some diagnostics on it before they give you a returns number.